NASA and the Johnson Space Center got good news as President Obama unveiled the space agency’s 2016 budget with a half-billion dollar increase over the 2015 enacted budget. “It’s a clear vote of confidence,” NASA Administrator Charles Bolden said during a visit to Kennedy Space Center in Florida. The $519 million increase in new funding over last year’s budget, Bolden added, will provide the necessary resources to continue advancing America’s space exploration plans and fund the space race between Boeing and SpaceX to eventually carry astronauts to and from the International Space Station. “Today, President Obama is proposing an additional $18.5 billion for NASA, building on the significant investments the administration has made in America’s space program over the past six years,” Bolden said. “NASA is firmly on a journey to Mars. Make no mistake, this journey will help guide and define our generation.” The 2016 budget year begins Oct. 1, 2015. However, it is not known what the Republican Congress will do with the proposal. 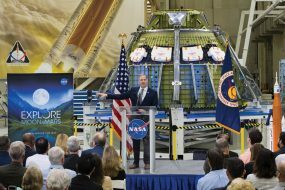 The proposed budget, Bolden said, allows the space agency to continue development of the Orion crew vehicle, Space Launch System and Exploration Ground Systems that are expected to one day send astronauts beyond low-Earth orbit. The Space Launch System, NASA explained, is a new heavy-lift rocket, more powerful than any previously built. SLS will be capable of sending humans aboard Orion to deep-space destinations such as an asteroid and Mars. 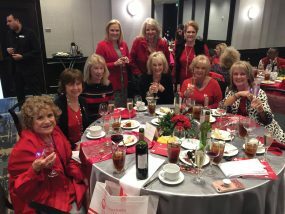 During the past year, several highly successful missions were accomplished, along with the maiden flight of the spacecraft Orion, which traveled farther in space than any spacecraft designed for astronauts in more than 40 years. Meanwhile both Boeing and SpaceX – the two companies NASA selected to build space vehicles under the Commercial Crew Program — have already completed some tests and expect to be able to fly astronauts to the ISS by 2017. 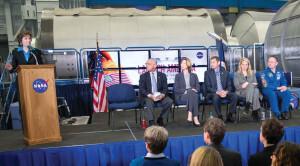 At a Jan. 26 press conference at Johnson Space Center, the two companies both said they were on track to fly U.S. astronauts to the ISS within two years. Boeing and SpaceX have already completed some of the preliminary testing necessary to get vessels in orbit. “I don’t ever want to write another check to Roscosmos (the Russian space agency) after 2017,” Bolden said at the JSC press conference to announce its progress. Currently, the U.S. pays Russia $71 million per seat to take American astronauts to the ISS.